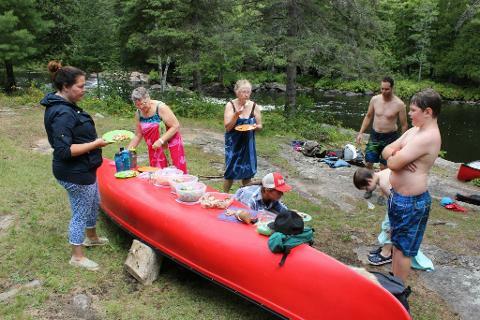 Connect by canoe to the Kawarthas’ rich history of with a paddling excursion on historic Eel’s Creek. The waterway is steeped in paddling lore, from its history as the sacred waterway leading to the Petroglyphs’ “teaching rocks” to its significance as a site for “Champlain’s rest” where the French-Wendat party camped upon returning from their ill-fated journey into Haudenosaunee land. Accordingly, our Eel’s Creek trip has been accredited as a signature experience of Ontario 400, because it celebrates four centuries of French heritage in our province. This waterway is a perfect example of Land Between Ecotone, as the course flows through landscape characteristic of Carolinian Forest and Canadian Shield woodland. High Falls is surrounded by rolling granite, and the site actually boasts several sets of falls. Everyone can find a spot to themselves where all they need to do is open their eyes and ears, feel the ground beneath them and take a deep breath to soak in the water, the sun-baked rocks and trees. After our paddle, we pay a visit to the Teaching Rocks at Petroglyphs Provincial Park and receive a lesson in the interpretation and history of the site from their amazing staff. Excellent, homemade meals with traditional foods from the area, including three sisters stew, wild rice salad and many wild edibles in their season. Rendezvous at MNR Parking Lot on Northey's Bay Road (HWY 56) . Accessed by turning right off HWY 28 at Woodview.